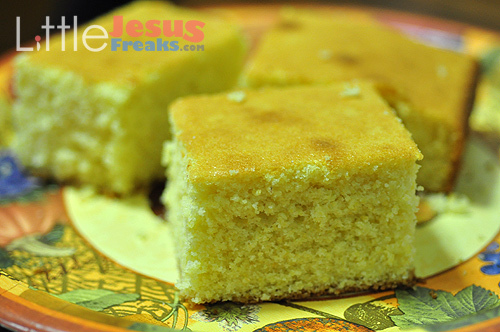 This is my favorite recipe for corn bread. I make it every Thanksgiving, and my brother-in-law, Jack, looks forward to it every year. It’s flavorful and moist, and a definite crowd pleaser. Enjoy! Preheat oven to 400 degrees. Grease a 13-inch x 9-inch baking pan. add to creamed mixture alternately with egg mixture. Cut into squares. Makes 12-15 servings. My husband, Joe, and I make sweet potatoes like this all the time. If you want your sweet potatoes to have a buttery flavor, you can certainly add butter to them when you add the cinnamon and brown sugar. Enjoy! Cook whole sweet potatoes in microwave oven, in conventional oven, or on grill until soft. Cut each sweet potato in half, and mash gently in skin. Sprinkle cinnamon on each half. Press 1-2 tablespoons of brown sugar into each half. Drizzle with molasses. This recipe is from my niece, Lisa, and from what my sister, Janet, tells me, it’s fabulous. Thanks for sharing, Lisa! In a large bowl, mix together 2 tablespoons hot water and 1 package active dry yeast until the yeast dissolves. Stir in the 1 1/3 cup warm water and 1/3 cup brown sugar and continue stirring until the brown sugar dissolves. Slowly add 4 cups of flour, stirring constantly. Continue stirring the mixture until it is smooth and does not stick to the sides of the bowl. To continue by hand: flour the counter lightly, and flour your hands. Knead the dough until it is stretchy and smooth. Lightly oil your counter. Grease your cookie sheets generously with butter or shortening. It is very important that you grease the cookie sheets well! Sprinkle greased cookie sheets with kosher salt. Using a liquid measuring cup, fill a large saucepan at least 1/2 full of water. For each 1 cup of water you add, add 1 tablespoon of baking soda. Divide the dough into 10 even pieces. Roll each into a rope, then shape them like a pretzel. Bring the water and baking soda in the saucepan to a gentle boil. Using a spatula, gently lower each pretzel into the water one by one, counting slowly to 30 before removing the pretzel from the water and placing it on the cookie sheet. Repeat until all pretzels are done. When all pretzels have been boiled, lightly brush each pretzel with the egg + 1 tablespoon water mixture, then sprinkle with more kosher salt. 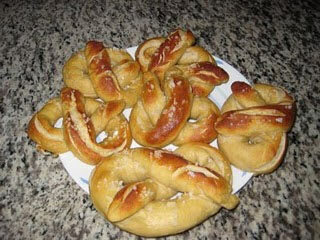 Bake for 8 minutes, or until the pretzels are golden. If you’ve never tasted homemade applesauce, you’ve got to try this recipe. It’s not as difficult or time-consuming as you might think, and the results are so worth it! Heat apples and water to boiling over medium heat; reduce heat. Simmer uncovered, stirring occasionally to break up apples, until tender (at least 10 minutes). Stir in remaining ingredients. Heat to boiling; boil and stir one minute. Note: I like to make this applesauce with McIntosh apples, because they tend to be softer and sweeter than most other apples. 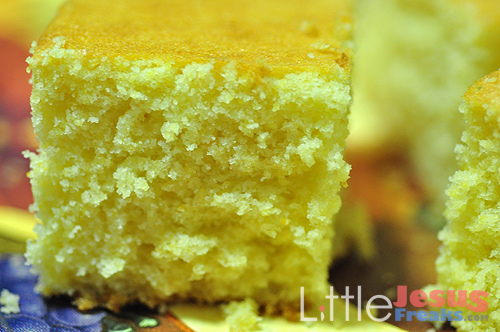 This recipe is an oldie, but a goodie. This salad is refreshing and delicious, and it’s the perfect accompaniment for a formal dinner or a backyard barbecue. Allow to sit in refrigerator overnight. This recipe made my dad famous for his baked beans. It’s a favorite at the Labor Day Farro Family Picnic each year at my sister, Joyce’s, house. Fry bacon strips until brown.